Identification: R. multiflora is a perennial shrub that grows 6-10' tall, up to a maximum of 20'. They form dense clusters of shrub, spanning as much as 30' across. The many stems originate from the base, growing upright. They then arch over and become almost trailing. The stems grow up to 13' long. Along the stems are stiff curved thorns. The alternate leaves are 3-4" long. They are pinnately compound, typically with 7-9 leafletsbut may have anywhere from 5-11 leaflets. The leaflets are 1/2 to 1"ovals with toothed margins. The top of the leaflet is smooth whereas the bottom is covered with short hairs and is paler. R. multiflora blooms in late spring with white or light pink flowers 1/2 to 3/4" across. The flowers often form a panicle 1 to 1 1/2" wide. In the late summer, the fertilized fruits form. These red fruits are round or ovoid, approximately 1/4" in diameter, and persist throughout the winter, often until spring. The seeds inside the fruit are angular achenes. Original Distribution: R. multiflora grows native in Korea, Eastern China and Japan. Current Distribution: It can now be found all over the northeast and midwest United States. It has been found almost everywhere except in the Rocky Mountains, the Southeastern Coastal Plains and the Neveda and Colorado desert. Site and Date of Introduction: R.multiflora was brought to the United States in 1886 from Japan It was introduced on the East coast. Mode(s) of Introduction: Originally, this plant was brought here to be used as rootstock for cultivated roses. Since then, it has been the "solution" to various problems. In the 1930's, the United States Soil Conservation Service strongly recommended planting this species to prevent ersoion. Concurrently, the nursery industry was advertising it as the perfect solution to fence in cattle and to create a natural crash barrier along the highway. Later, in the 1960's, wildlife biologists were recommending this plant as a good source of food and shelter for the fauna. Until recently, humans have been the main spreader to this plant. Reason(s) Why it has Become Established: The primary reason that this plant has become so successful is the widespeard and intense distribution by humans. We planted this shrub in various habitats across the United States. In addition, this shrub has many characteristics that further helped it succeed in dominating the landscape. It is capable of propagation in two ways: by seed, or by the formation of roots when a stem touched the ground. This allows the plant to reproduce asexually even when conditions may not be right for flowers to form. When it does flower and fruit, up to 500,000 seeds can be produced. These seeds can remain dormant in the soil for up to 15 years, so it can appear years after it was thought to have been eradiicated. The fruits are appealing to birds and mammals which carry the seeds to new locations. R. multiflora can survive and thrive in a variety of habitats. It is found in prairies, savannas, open woodlands, forest edges, old or abadoned fields, mature forest, roadsides, etc. Its soil and environmental requirements are broad, but it prefers well-drained soils and good sunlight. The only conditions it is found in is extreme cold, with an intolerance to temperatures below -28` F, dry or wet areas. Ecological Role: This plant is a major food source for many birds and mammals, especially during the winter. The persisting fruits are a good source of nourishment since many other plants drop their fruit when ripe. Cedar waxwings, American robins, grouse, ring-necked pheasants and wild turkeys are common consumers of the fruit. The leaves and fruit are sources of food for chipmunks, white-tailed deer, opossums, coyetes, balck bears, beavers, snowshoe hares, skunks and mice. In addition to the leaves and fruit, the twigs and bark are also edible for some animals. Cottontail rabbits often snack on these. R. multiflora also serves as cover or nesting habitat for many animals. Cottontail rabbits, white-tailed deer, pheasants and mice use the thick, sometimes ubiquitous clumps to protect them from predators. Catbirds prefer to nest in its dense thicket. Other birds have also been found to nest in the shrub. Benefit(s): As mentioned above, this plant is a good source of food and cover for many of our native animals. It is also an inexpensive, natural, low-maintenence fence that is also aesthetically pleasing. Threat(s): After R. multiflora invades an area, it often creates dense thicket, preventing light from shining through. The native vegetation often dies as a result. The habitats that are created are now monocultures.. This dramatically reduces foraging quality for both animals that consume it and those that did not adapt to the introduced fruit. Aside from the threats to wildlife, the invasion of this plant affects our livelihoods. When these thickets form, they create impenetratable walls that may block our access from once walkable areas. Even designated recreational and park trails have been affected. Pasture land has been overtaken, preventing cattle or horses from grazing. When it is present next to farms, it has been found that agricultural yields are lower due to R. multiflora's competition for nutrients. Control Level Diagnosis: Ecosystem dependent - if it may threaten native flora, it should be controlled. Control Method: There are several ways to control the spread of R. multiflora. This first has already been put in place. It is now illegal to plant this species. Now that this step has been taken, the threat of further spread can be addressed. Techniques for removal include mechanical, biological and chemical. If possible, mowing should be undertaken. Mowing repeatedly, up to 3-6 times per year for 2-4 years, will control the spread of the shrub and has been shown to prevent the growth of seedlings. This is not possible, however, when the plants is near maturinty (as they grow too high for a mower) or are located in a difficult area such as in rocky, uneven areas. Hand cutting can be helpful although it is rather time consuming. In mature thickets, hand cutting should be the first step, followed by repeated mowings. Mowing or cutting once per year after initial invasion is controlled will prevent further spread. Fire does not seem like an effective method of control, as sprouts regenerated after experiments. Several types of biological controls exist aleady or are being tested. Rose rosette disease, carried by the mite Phyllocoptes frutiphilus , is a native virus that is fatal to R. multiflora. Unfortunately, it is also kills our native roses and plums, in addition to commercial species such as apples, berries, and cultivated roses. 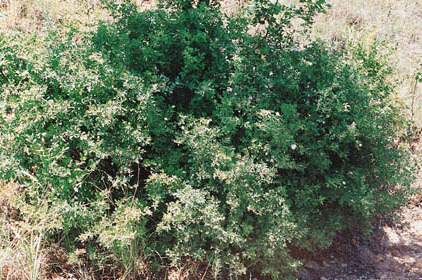 Although it is not recommended to increase or introduce this disease, it may naturally infect this shrub. Pruning R. multiflora may create an increased likelihood of infection. Another control method is the the European rose chalicid wasp, Megastigmus aculeastus. This non-native has been found in nurseries on the East coast, apparently brought in with imported rose seed. These wasps lay one egg in the fruit, which hatch into larvae. The larvae consumes the contents of the seed. In the late spring, the adult emerges. It is a weak flyer with a short lifespan. The adult completes the lifecycle, theoretically on the same plant or in the same thicket, effectively destroying the plant over several generations. The rose stem girdler beetle has also been found to negatively impact this invasive. It chews a ring around the stem of the plant, killing it. It should be kept in mind that although these methods are 'natural' they all have the potential the strongly impact native roses or other species in the Rose family. The most effective means of control seems to be herbicides. Glyphosate, 2,4-D and picloram are considered excellent controllers of invasion. A 1-2% V/V solution of glyphosate should be sprayed in the spring and summer to fully reclaim the area. It can also be applied directly to cut stems either during the growing season or when dormant as a 10-20% active ingredient. Application during dormany is preferred to avoid damage to surrounding plants. It is considered non-selective, so some caution should be exercised during application. After some experimental spray applications, grasses were still found to be growing underneath the shrub, indicating relativety safety to surrounding vegetation when applied properly. Picloram alone or in combination with 2,4-D was found to be very successful in controlling the plant. Other possible herbicides include dicamba, triclopyr and fosamine. Triclopyr should be applied when plants are dormant, and can be applied either as a spray or directly to cut stems, though it must be used within a few hours of cutting. Fosamine is preferred when trying to protect surrounding herbaceous plants, as it only affects woody plants. Growth regulators have also been used, although only in the experimental phase. Chlorflurenol, maleic hydrazine, and MBR-18337 seem to be effective against the prooduction of fruit. Eckardt, Nancy. 1984 (12/8/2002). Element Stewardship Abstract for Rosa multiflora. The Nature Conservancy. Munger, Gregory, T. August 2002 (12/6/2002). Introductory, Multiflora rose. USDA, Forest Service. USDA (12/6/2002). Plant Profle for Rosa multiflora Thunberg ex Murray. Wisconsic Department of Natural Resources 7/29/2002 (12/6/2002). Multiflora Rose. The Samuel Roberts Noble Foundation, Inc. (12/8/2002). 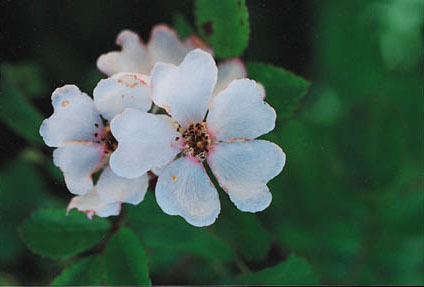 Multiflora rose, The Noble Foundation Plant Image Gallery.